Hurricane Irma once again shows us the importance of mapping supply chain risks for the pharmaceuticals industry. The storm has passed, but the effects will be felt for months to come. In the Florida Keys up to a quarter of homes in the low-lying islands are reported to have been destroyed. Many in the Caribbean have had it worse. There will, as always, be lessons for industries, including pharma. Puerto Rico, for example, is a huge centre for pharma manufacturers – the fifth biggest in the world with more than 80 plants. It accounts for about a quarter of the country’s GDP. The island was actually spared the worst of the hurricane, but still three died, 50,000 were left without water and 600,000 without power. The storm served once again to expose the fragility of the island’s infrastructure. Nor are hurricanes the only recent disruption to hit the island. Only at the start of the summer did it declare its outbreak of the Zika virus over, after it infected more than 40,000. It’s not just Puerto Rico, of course; Irma brought potential for disruption across the Caribbean, to Florida and on inland. And it’s not just Irma; it followed hard on the heels of hurricane Harvey. The industry has got better in recent years at dealing with these events, not least because of government encouragement to avoid disruption to medical supplies that can exacerbate the tragedy. One of the untold stories of both hurricanes Harvey and Irma is the shortage of urgently needed medicines; untold, because the problem was largely avoided with some improved planning. But we’ll be tested again. Yes, hurricane Irma was unusually strong, but we’ve seen storms this powerful – and perhaps more so – before. We’ll see them again. The role of climate change in developing such storms will continue to be debated. What’s unarguable is that pharma – and a wide range of other industries with global supply chains – will always be at risk of exposure. Modern technology is a big part of the answer to managing this risk. The information businesses and the public have on a hurricane’s trajectories and strength is unparalleled; they can now track it online in real-time. Combine that with modern software solutions and we can quickly map risks for at-a-glance understanding of exposures. That’s always useful in directing emergency responses when the storm comes. It’s more useful, though, used to map exposures and build resilience through continuity plans before. The power of Irma may have been a surprise, but storms in the hurricane season are not. Fortunately, we have the tools to weather them well; we just need to make sure we use them. There’s work to be done on all sides – not just by the negotiators – to prepare supply chains for a future outside the EU. For anyone already sick of Brexit, Michael Barnier’s recent announcement won’t have been encouraging: “The hard work starts now,” the EU’s chief negotiator Michel Barnier told reporters – more than a year after the UK voted to leave. It’s a big issue – and a particular challenges for some. One is the pharmaceuticals industry, and a couple of days before Michel Barnier was urging the UK to knuckle down, leaders in the UK and EU pharmaceutical industry were issuing a warning to both Barnier and Britain’s Brexit Secretary David Davis of the risk to supplies of life-saving medicines. “In the case of an unorderly withdrawal, there is a risk that all goods due to be moved between the UK and EU could be held either at border checks, in warehouses or manufacturing, and/or subject to extensive retesting requirements,” the letter warned. And it’s not just the industry that’s worried. The week before, the UK’s health secretary and its business secretary called for continued co-operation with the European Medicines Agency after the UK left the EU – “in the interests of public health and safety”. Hopefully, these warnings will have their desired effect, and arrangements – transitional or otherwise – will be in place when the negotiations finish. In that case, this will all be put down as a crisis averted or just another “scare story”, according to taste. As we’ve noted before , though, whatever happens Brexit will be a game changer not just for pharma but for all businesses. The currency volatility we’ve already seen could well return as the deadline for negotiations gets nearer; the regulatory framework remains uncertain; and supply chains are going to have to get more complex – perhaps in the short-term, as contingencies are put in place, or in the long-term to deal with new realities. Many companies have already made changes to their supply chains to make them more resilient to whatever results from the negotiations; many other are still looking but have at least gained an understanding of the risks they face and the vulnerabilities in their supplies. For any that haven’t made much progress, though, or those that haven’t even begun, the hard work truly does need to start now. Time is not on our side. Businesses have a window of opportunity to make preparations for a more protectionist future. It will not be open forever. John Major’s intervention aside, a hard Brexit remains the government’s position on the EU, and industries are starting to take note. Today, The Times reports UK car manufacturers are looking to source more parts domestically in response to the threat of tariffs when the UK leaves. Over time, the current ratio of two thirds sourced internationally to one third at home may be reversed. The concerns are not restricted to the UK, nor worries over Brexit. Going local was a key message at this year’s Davos meeting of the World Economic Forum, as businesses try to pre-empt a Trump-led populist backlash against globalisation. Furthermore, while they’re particularly exposed, it’s not just car makers in the firing line. According to the new head of the President’s National Trade Council, repatriating international supply chains is a priority for the new administration. In the UK, meanwhile, the Road Haulage Association has warned of fresh food rotting as Brexit “cripples” supply chains – tariffs or no tariffs – if the right customs controls aren’t in place. We’ve noted before that predictions about the impact of Brexit are particularly unreliable. Confirmation the UK will exit the single market and full membership of customs union have given us some indication of what to expect from Brexit. Until negotiations get well underway, however, and even then, there will continue to be massive uncertainty as to the final trading relationship, tariffs and customs arrangements in place. The same is true to an extent in the US. Despite the frantic activity of the Trump administration, it will be some time yet before it becomes clear to what extent Trump wants – and can – pursue an isolationist trade policy. These are not reasons to wait, though. Rather, they give time to act – and it may end up being a narrow window of opportunity. The speed and size of currency movements since the Brexit vote has already shown how quickly things can move. Likewise, in the US, should some of the more worrying potential consequences of the new administration’s policies and rhetoric materialise, they could do so quickly. If organisations don’t yet have the confidence to anticipate the future trading landscape, they do at least have sufficient warning that changes are on the way. They need to be building resilience in their supply chain now – ensuring they have the visibility and flexibility to react when the time does come. It’s a new year, but the problems for supply chains are much the same. Among them, increasingly, is industrial action. December drew comparisons with the Winter of Discontent with strikes or threats by Post Office staff, train and tube drivers, airport workers, and even Argos delivery drivers. With the tube strikes this week, that discontent has followed us into 2017. As others have noted, comparisons with the 1970s are overplayed. It actually became harder for unions to take legal strike action in the UK last year, for example, with the passing of the Trade Union Act in May. Unions now require a ballot turnout of at least 50% for industrial action – and 40% support of all eligible to vote when it comes to vital public services such as health, education, transport, border security and the fire brigade. Nevertheless, recent activity does suggest something of a resurgence in the UK following a near-record low in the number of days lost to industrial action in 2015. The action we’ve seen also has significant impacts. Academics estimate the Southern Rail strikes alone have cost the UK £300 million. The tube strikes this week may even cost the same, according to some of the higher estimates. Moreover, while levels of UK industrial action have trended downward in the last few decades and remain modest, they’re much higher elsewhere, including in some of our near neighbours. France, Denmark, Norway, Belgium (which saw a particularly high number of strikes last year), Spain, Finland and Ireland have all lost anything from double to seven times the number of days as the UK to action in recent years. If businesses are not directly affected themselves, others in their supply chain may well be. All of which is simply a reminder that industrial action remains a key threat to the supply chain. Businesses need to build in resilience and redundancy to account for it, and to do that, they need to have an accurate view of their exposures. The new Cyber Highway service makes it easier than ever for businesses to start to asses the cyber security of their suppliers. It’s an opportunity more need to take. Cyber is rising up the supply chain. Last month former Home Secretary David Blunkett launched the Cyber Highway, a new website through which business can check whether suppliers are certified under the Cyber Essentials scheme. The scheme promotes basic standards of “cyber hygiene” to protect against common risks such as hackers and malware infections. Businesses can have a self-assessment questionnaire independently reviewed by an external certifying body to gain a Cyber Essentials badge or have an external body actually do the tests for a Cyber Essentials Plus badge. For central government, all contracts handling personal information or providing certain ICT products and services have required certification with the standard since October 2014. Two years on, the new Cyber Highway site makes it easy for private sector businesses to effectively apply the same standard. They can now track suppliers’ progress towards Cyber Essentials certification in real-time. It’s hoped this will, in turn, prompt more businesses to sign up to the scheme and work to achieve certification – vital following the vote for Brexit, according to Blunkett. “It is more important than ever, post-Brexit, for businesses to hold an internationally-accepted certification, as competition increases and an extra level of cyber-resilience is required,” he said at the launch. There’s also a couple of other reasons to welcome such moves. One is that many big security breaches can be traced back to attackers exploiting vulnerabilities of suppliers. That might mean criminals targeting businesses’ raw materials suppliers or just service providers. The data breach at US retailer Target, which in 2013 had 40 million customer details stolen and leaked, remains perhaps the prime example of the latter. That attack was the result of network credentials stolen from its refrigeration, heating and air-conditioning subcontractor. The second reason to welcome initiatives like the Cyber Highway is related to this: Many businesses still seem to be complacent about this aspect of their supply chain risk. Anything that gives businesses the tools to start changing this can only be a move in the right direction. It may not seem it, but the deadline for company’s statements on tackling modern slavery is deadly serious. 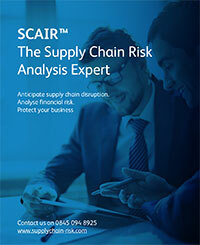 Businesses need to be sure they know what’s happening in their supply chains. Human rights is the number one corporate social responsibility issue in supply chains, according to a recent survey. It ranks ahead of even environmental concerns and traceability when it comes to identifying essential concerns in the coming year. It’s hard to argue with this: Human rights are a key focus of not just consumers, but also government in attempting to crack down on abuses. And one key example is regulation to fight modern slavery. The end of September marked the “deadline” for big organisations with a financial year ending in March to publish their modern slavery statements. In the statements – introduced by the Modern Slavery Act 2015 – organisations supplying goods or services with a global turnover of £36 million are expected to set out the steps taken to ensure modern slavery is not taking place in their business or supply chains. On the one hand, the requirement doesn’t seem too taxing. It is, for instance, a “soft” deadline: government guidance says only that businesses should publish their statements “as soon as reasonably practicable” after the end of each financial year, and “encourages” publication within six months – hence the end of September cut-off for those with financial years ending in March. This is, as others have pointed out, “a light-touch approach”, and some of the initial efforts seem to reflect a failure to take the new rules seriously. According to one analysis of the statements submitted so far, most fail to meet minimum standards the Act sets out. The majority, for instance, are not signed by a company director or are not available from the company’s website homepage – two basic requirements. Nevertheless, the advent of these statements is an important milestone. For a start, the availability of statements from hundreds of companies introduces a benchmark by which policies can be assessed. They are also likely to be pored over by campaign groups, including those focused on “strategic litigation”, bringing cases in the civil courts to penalise abuses. Finally, more moves against slavery in the supply chain can be expected, with Theresa May recently reiterating her commitment to the issue as Prime Minister. Given all that, statements are going to be more than just a PR tool. Some, according to the UK’s Anti-Slavery Commissioner, are likely to end up as evidence of whether companies ought to have known slavery in their supply chains was taking place – making them guilty of a criminal offence. The statements are really just the start; businesses need to be sure they have the visibility and processes to root-out abuses in the supply chain. Will Brexit break your supply chain? We know the result, but not much more. The only certain conclusion we can draw from the EU referendum vote is that we’re in for a period of uncertainty. In one sense, little has changed. The UK’s membership of the EU continues. David Cameron has said it’s up to whoever replaces him to officially notify the European Council of the UK’s intention to leave and that won’t be until September. Then there’s a two-year period to negotiate a “withdrawal agreement”. Even that may be extended. The UK could remain in the EU into 2019 or longer. So, on the one hand, nothing’s changed. On the other, everything is different. Whether you support Brexit or think it’s madness, it’s impossible to deny it’s a game changer. First, there’s the short-term uncertainty. Even the most optimistic supporter of Brexit would struggle to claim we’re not likely to see increased volatility. Big currency moves, for example, are likely to be a fact of life for some time to come. We’ve already seen a 31-year low against the dollar. One analyst has predicted it could fall to parity by the end of the year. Whether that’s true or not only time will tell, but less settled currency markets will be here for the foreseeable future. The impact on costs of overseas supplies and raw materials could be significant. Uncertainty also means investments are more difficult to predict, both for businesses themselves and for suppliers. That could affect plans to support growth. Longer-term, though, the big questions are likely to be about access to markets. This is not always going to be simply about tariffs. There are other dangers in going your own way. Before the advent of the single market, for example, it was often impossible to sell a product designed for one EU market in another due to different technical standards or regulations operating in each. Manufacturers must keep an eye on these barriers creeping back in. Existing harmonisation in industries may be eroded over time by new regulations and developments in either Britain or the EU. Equally, they may be the result of intentional protectionist measures introduced by the remaining EU countries. Any arrangement other than membership of the EEA like Norway’s is likely to see either a change in the UK’s terms of trade with the EU or the possibility to change its terms with those outside – and perhaps both. That could mean opportunities, as well as challenges. But if it means sourcing from new markets or just navigating new rules when buying from existing suppliers, it will mean changes to the supply chain that have to be managed. There’s no crystal ball, but there are things businesses can do to prepare now. Most obviously, they need to look at anything they can do to make their supply chains resilient. Dual sourcing from suppliers both within and outside the EU could be one way businesses hedge their bets, for example. Even before considering that, though, businesses need to make sure they really understand their supply chains, and have visibility across them. That will enable them to consider the impact the various possibilities may have and plan accordingly. It will also mean they can react faster and more intelligently to the dangers and opportunities Brexit brings when the time does eventually come.